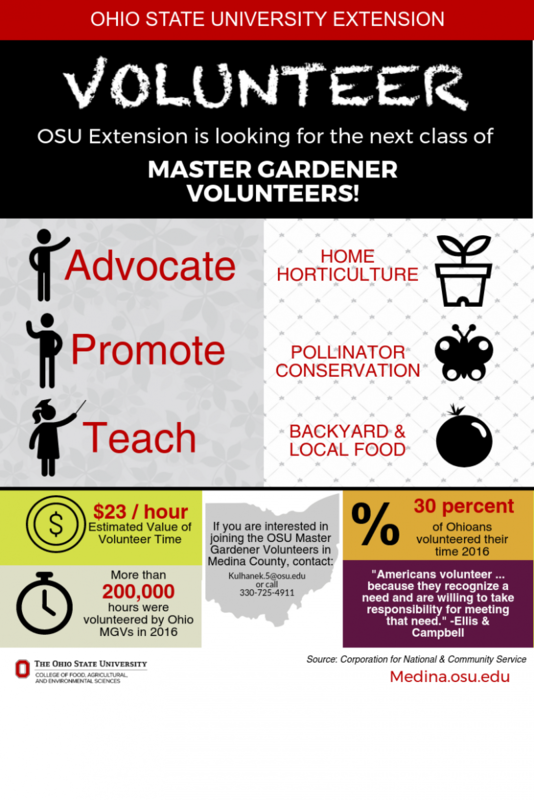 The Ohio State University Extension Master Gardener Volunteer Program provides intensive training in horticulture to interested Ohio residents, who then volunteer their time assisting with educational programs and activities for Ohio residents through their local OSU Extension county office. Volunteers are not required to have gardening skills or knowledge; but a passion for learning about gardening and sharing this knowledge with others is a must! Working with county Extension personnel, Master Gardener Volunteers provide such educational services to their communities as: answering gardening questions from the public; conducting plant clinics; gardening activities with children, senior citizens, or disabled persons; beautifying the community; and developing community or demonstration gardens. More information about state-level Master Gardener Volunteer programs and activities is available at http://mastergardener.osu.edu. Master Gardener Volunteers are trained in the summer/fall of EVEN years in Medina County. Call for applications will go out in January of the training year with an open house in March/April. Join our mailing list to stay informed of important deadlines!